I got 2 different wrappers today, wrappers for panfrying and wrappers for wontons. Wrappers for pan frying are different. 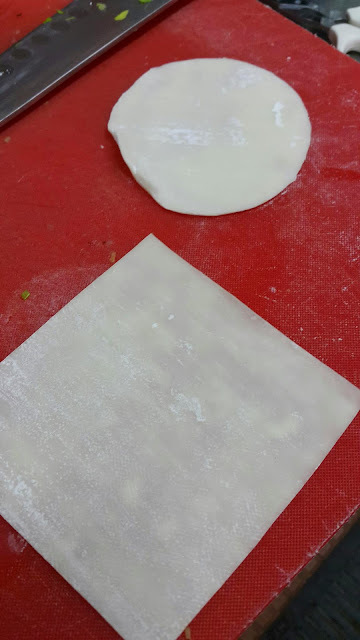 The edges are supposed to be thinner on the outside and thicker on the inside so that once the dumpling is made, the thickness of the wrapper is uniform. The wrapper is also thicker as it needs to be panfried and too thin a wrapper would make it break easily. Wonton wrappers are much thinner as they are intended to be cooked in water. But this time, I cut and shaped them oval, just like the dumpling wrappers and wrapped them for frying. Both tasted great, but I think wonton wrappers made the dumplings more delicate and the skin was crispier. For a richer dumpling with more meat, I think dumpling wrappers would be better.